SWTOR beta weekend review: long-form goodness! You are here: Home / SWTOR / Community / SWTOR beta weekend review: long-form goodness! We had the privilege this week of receiving an email from James Layton, a Sydney-based SWTOR tester who mentioned he’d written a very detailed review, based on his experiences over the past beta weekend. He kindly agreed to have the review appear here on TOROZ and what a great review it is. If you like your information detailed, then hunker down and enjoy some serious insight into SWTOR in its pre-launch form. Thanks James! I should probably start with an overview of the system I was running the game on. The PC is about 8 months old, it’s an Intel i7 950 3.04Ghz 8 Core with 6Gb of RAM and an ATI HD6780 1Gb Video Card – it cost about $800 8 months ago. Previous Beta testers have reported that the game runs better when run from an SSD drive as drive access speed can affect performance. I was running the game from a hardware RAID1 array so that wouldn’t have helped my overall performance. With that being said, I had absolutely no problems with the performance of the game. For the majority of the weekend I left the graphic settings at default (mainly High for most settings but Mid for things like shadows and draw distance). On the last day I set all graphics settings to the absolute maximum and I had no issues whatsoever running the game smoothly and cleanly. Load times were very short (~2-5 seconds on loading screens), and the game only crashed to desktop once during the entire weekend. The highest ping I recorded during the weekend was 253ms. Other people in the beta said that they experienced graphical issues with the game including missing textures or the screen going blank during conversations. The majority of problems seemed to stem from ATI graphics cards (if in game chat was to be believed) and most of them were resolved by updating drivers. My ATI card was 3 versions behind but I didn’t experience any graphics issues. There were several times when other players’ companions appeared to be naked on my machine, but I suspect this was a game issue rather than a hardware issue. Other players also reported this problem. A friend of mine that played in the beta also had good performance from an Acer Intel i5 laptop with 1Gb graphics, though his load times were a little longer. I had a couple of small dramas with the installation of the program. The download from the website was basically the launcher which started installing the game as though it were a patch. There was no option to change the installation directory – which ended up being Program Files (x86)/Electronic Arts/Bioware/Star Wars – The Old Republic/. I took some screenshots that didn’t appear in the installation directory, I later found they went in to a directory under My Documents. The total download/installation ended up being 18.5Gb. For anyone interested, simply copying the installation directory to another computer works fine. My dramas during installation were mainly with the launcher. The launcher includes two progress bars – one for the current file, and one for the whole installation. On my launcher, the second bar showed as full for the entire installation. While reading third party SWTOR sites, I came across a number of people that had had the same issue on the previous beta weekend. They claimed that if this occurred, then the files would be installed corrupt and would need to be reinstalled. The offered solution was to restart the launcher until the progress bar did not glitch. After restarting the patcher continuously for about 2 hours without success, I gave up and just let it run. The next morning I read that the progress bar display issue didn’t affect the installation of the files with this build. Overall, the download and installation took just under 24 hours, so I was ready to go with plenty of spare time. Some people online reported download speeds as low as 17kbps and the full program wasn’t even downloaded by the end of the weekend. I got around 400kbps for most of the download, but other friends reported getting over 1Mbps in Australia. My plan was to stay up on Saturday morning and be there for launch. When the servers went live at 0300 our time I had a couple of issues with getting on for about ten minutes. Initially the launcher kept telling me that my password was incorrect (despite me triple checking multiple times to make sure it was right) and when it did eventually let me run the game, the server list came up empty. Eventually the US East servers came up so I created my first character on Firkrann Crystal server. During the weekend, I had very few issues with getting in to the game. I played from 0300 until about 0530 on Saturday before having a power nap and getting back on at 0830. When I logged on then there was a queue for every server. The server page indicated the wait would be 32 minutes, but it ended up being about 7 minutes. The launcher did say that server queue times were still being perfected. Some players reported seeing queues as long as 13 days, but no one reported waiting longer than half an hour. The next time I had to wait was Sunday morning when I got on about 0900 – this time the wait was about 3 minutes (though the estimation was 20 minutes). By the end of the weekend, I believe Bioware had just over sixty servers running. There were no other waits to get in to the game for the rest of the testing period. Prior to the patch mid-weekend, I had issues with getting out of the game. If I used the /logout command, the program would freeze on the loading screen. If I used /quit, nothing would happen. I had to alt-tab to Windows and then manually stop the program. After the mid-weekend patch, I didn’t experience this issue again. Once I was in the game, I did some playing with the user interface. The default UI gives the player twelve buttons on a single quick bar that can be switched up and down like in WoW. Three more quickbars can be added, one below the standard one, plus one up each side of the screen. None of the quickbars can be moved. Keys can be mapped to any quickbar slot, though right clicking on an object in the environment will always cast the first quick slot on the first quickbar (this can’t be changed from what I could see). The minimap is pretty standard for an MMO, though at the start of the weekend every time I zoomed it out it would reset to default whenever I logged in. This problem was apparently solved at some point during the weekend. Some buttons on the menu bar or the companion bar would occasionally become inactive when they shouldn’t be, though these actions could still be activated by their keybind. One of the best features of the TOR user interface is looting. Like WoW it has one click looting, but unlike WoW, it also supports area looting. Basically, if you kill a group of mobs, right click on one, and everyone is looted. The range appears to be about 30m which will normally handle most groups of enemies. There is a single bar with 30 slots by default. Rather than purchasing bags, the player pays to expand the bag space by one row (10 slots) at a time with a gradually growing cost for each row. All mission items (including collection items) are stored in a separate 90 slot bag, so they don’t take up space in your regular bag. I didn’t have any major issues with the UI myself, though a lot of people weren’t so happy with the inability to move parts of the UI. I had some problems with how it worked with the Imperial Agent’s abilities, but I’ll mention that later. I didn’t move my abilities around during the beta, but I think in the game proper I’ll set the abilities up a little better. All classes get a 60 minute group buff and most get toggle-able abilities, so I’d probably move these to the side bars and then save the main quick bars for cast abilities. There’s a stack of videos of character creation on the web now that the NDA has dropped, so I pretty much knew what to expect here. Most people are complaining that the customisation engine doesn’t support morphing sliders (like in Rift), but rather uses presets (like in WoW – though there are a lot more options). Personally I prefer the way they have done it. Other players will not only regularly appear around you in the world, but also during the conversation cut-scenes in things like flashpoints. Presets ensure that all characters look “normal”, with no distorted facial features from people being silly with the sliders. Both genders have four preset body types – a slim/small figure, a normal figure, a strong figure and a “large” figure. On men the latter looks fat, on women it makes them “curvy”. The other sliders are different depending on race – so Zabrak get horns as a slider, Miralukans get masks, etc. I wasn’t happy with a lot of the hair options – there were plenty – but a lot of them just seemed silly in my opinion. All told there are eight sliders each having between 4 and 30 options, so there appears to be a lot of customisation options despite the lack of a morphing engine. I was pretty broken up about what to play during the beta. Some people had suggested playing the mirror class to the one you intend to play at launch (which in my case would be Jedi Consular, as I intend to play the Sith Inquisitor at launch) and others said to play the class you intend to play at launch, that way later on you can hurry though the content you have already seen at launch and avoid the crowded areas of the game. I decided to go the latter. I was torn between making a Human or a Twi’lek at launch. My concern was that from the videos I had already seen online, I didn’t think that the voice actor for the Sith Inquisitor really fit a Twi’lek. I originally planned to try a Twi’lek during the beta to confirm my suspicions but I didn’t like any of the facial options while I was making the character so I went with a Human and I’ll do the same at launch. I am a tabletop roleplayer and a big fan of computer based RPGs and Bioware RPGs especially. Normally when I play one of these sorts of games, I like to play it like a roleplaying game. When I get a choice I’d rather do what I think my character would do, rather than what I think will give the best in-game results. To that end, I decided any character I make in TOR is going to have a personality I intend to use at the start. For my Inquisitor I decided a character that is power hungry and self-obsessed, but that won’t simply pursue evil for evil-sake. I found it amazingly easy to see the character come to life through the conversation options. The Inquisitor starts out with a couple of base lightsaber attacks (though like all force-wielding classes in the game, they don’t start with a lightsaber). This meant that my character began her career as a melee combatant. Once I started acquiring new abilities as I levelled, I received a few ranged lightning attacks. This meant that I would start the fights with a ranged nuke and then close to finish it with melee attacks. Eventually, as I levelled (and especially when I took my advanced class as Sith Sorcerer and all of my ranged abilities had their range tripled), I found myself fitting in to a ranged roll, only resorting to melee when my force power was low or I got surrounded. One thing I liked about the game play was that it wasn’t as simple as having a good rotation. Each ability had a practical application and I had to dynamically use my abilities based upon my situation and where my cool-downs were at. This was certainly the case with all the classes that I played. The character really felt like it was growing as I played – the storyline developed (the character went from prospective Acolyte to Apprentice of a Sith Lord to independent Sith agent. The gear developed, with the character looking more and more like what I expected of a Sith Sorcerer. Finally the character developed in play style. As new options opened up with new abilities, it felt like the character was getting more powerful – not just doing more damage. I got my first companion at level 8, which is apparently relatively late for some classes. This certainly changed the play style as I could take on larger groups. General mobs in TOR have several types – Weak, which a character can easily kill five of in one go; Normal, which you usually attack three at a time; Strong – which you fight individually or with a single normal minion; Elite – which you really need your companion to take on; and Champion – which requires a full group of characters to defeat. I really didn’t like the first Sith Inquisitor companion – my main issue is that it doesn’t speak basic, so when it speaks, you need to read the translation – it just takes a bit longer and takes a little immersion out. From what I have read, it’s pretty important to the plot, so the character is encouraged to use that companion as much as possible. I was amazed that despite the fact I was playing with so many other people, there was no waiting or queuing for quest objectives. There were always a lot of mobs to kill, and at the end of the day, quests weren’t about killing mobs or collecting drops. Each quest had a storyline – you actually knew why you were doing what you were doing. That being said, each quest has hidden bonus objectives. For example – one of the very first quests for the Sith Inquisitor and Sith Warrior, is to go in to a tomb that is infested by K’lor Slugs and detonate explosives in their breeding chamber. Obviously there are K’lor Slugs in the way of this objective, and when you kill one, you suddenly get a bonus objective to kill 5 more – which seems to happen naturally while you’re getting to the explosives. Meeting the bonus objective just gives you more xp, but it’s not required. During the entire weekend, I didn’t receive a single main quest to kill x many mobs or collect y many collectable – these were only ever bonus objectives. With one character, I did get a bonus objective to kill 50 mobs during a major storyline quest. I rolled my eyes at this, but just kept going forward with the quest and the next time I looked at the bonus objective, I already had 36/50 kills. It seems to go very fast when you are pulling and killing 5 mobs in a single go sometimes. The game is designed to make you feel heroic so more often than not, you’re taking on apparently overwhelming odds, not just a single mob at a time. Over the whole weekend, there were only three occasions where I had to wait for a killed mob to respawn or an object to become interactable again. This may not bode well in the long run however – some people have commented that (especially on Korriban), some zones have a lot of mobs, enough that you can’t run very far without having to fight. This will be a problem when the starting zones are no longer crowded with other players clearing a path for you. Each planet has group quests. They are either HEROIC 2 – able to be completed by just a player and their companion; HEROIC 2+ – able to be completed with two players and their companions; and HEROIC 4+ – requiring 4 players and their companions. Generally speaking, each planet seems to have about 4-6 of these heroic quests. Once I was done with all of the single player quests on Korriban, I got a group together and we tackled the group quests. The only issue we had was that because of the large number of players in this beta (about 1.5 million apparently), each world was sharded in to multiple instances with around 500 players on each instance of the world. Despite separating the players, the general chat channel crosses all instances of that planet on the server, so when we first got a group together, we found that one of our group was on another instance of Korriban. It took us about ten minutes to work out how to change shards (it’s done through the map for the record), the person accidently switched to the wrong instance and found that there was a 30 minute cool down to change again. That person had to leave and be replaced but once we had everyone in the right place, on the right server, the quests were quite easy with multiple people. At level 10 I left Korriban and went to the Imperial Fleet. This is the Orgrimmar of TOR. It has every type of vendor, every skill trainer, every class trainer and access to all of the Flashpoints – it seems to be where everyone hangs out when they are not on a planet questing. I picked up my advanced class here. There have been complaints in the past that this process was a little over simplified for such an important choice (and one that can’t be changed later). In this build you can actually preview the talent trees of each AC before selecting and once you select your AC, you get a care package of items to get you started on that path. I spoke to my skill trainer after getting my AC and I was surprised that there were no healing powers in the list given that I had picked a healing AC. Later when I went back to my trainer I noticed that there was a second tab of abilities I could learn that were specific to my AC that included the healing abilities. This wasn’t apparent at the point I took the AC so I’d say it’s a mistake that lots of people will make – not purchasing the abilities of the AC if they don’t realise. I also picked up my crafting professions at the Imperial Fleet but I’ll cover those in a later section. Finally I ran the Black Talon flashpoint which is intended for level 10 with two of my friends. I’ll also cover that later. Then it was off to the next planet – Dromund Kaas. Dromund Kaas is much larger than Korriban, but thankfully, at level 14 all classes get a sprint ability which gives you a 35% speed buff while out of combat. The play style was very similar to Korriban – complete solo and class quests, advancing through the levels and world as you go, complete optional heroic quests and eventually (around level 16) you complete your class prologue, get your ship and are sent to a choice of two worlds to continue in to Act 1 of your storyline. I want to take a moment to talk about light side and dark side points. Because I chose to play a character personality, I based my choices on what I felt my character would do, not what got me what sort of points. At the time I stopped playing this character I had about 150 light side points and 1,300 dark side points, giving me a total score of just over 1,000 and a Dark rating of 1 (which turned my character’s eyes from a normal blue to a sickly yellow). On some occasions I didn’t agree with when light side or dark side points were awarded. You always know before you get them, but it doesn’t stop you from questioning why the developers thought a particular action went one way or the other. I won’t give the best example because it’s a major storyline spoiler, but a another example that’s not story specific was that my character met an alien slave in one of the tombs on Korriban (an Abyssan if my Star Wars memory is correct) that complained he used to work for a Sith Lord that fed him, but that the Sith Lord had abandoned him in the tomb and stopped feeding him. I found the Sith Lord, that revealed he used to feed the creature the bodies of failed acolytes but he stopped when he learned that the creature was absorbing Dark Side energy from the bodies and gaining power. He feared that the creature would develop a taste for people strong with the Dark Side and attack the academy. He asked me to deliver poisoned food to the creature to cripple it. Giving the creature the poisoned good gave me 50 light side points. If I wanted dark side points, I was supposed to loose it upon the academy to kill Sith acolytes. Didn’t seem right to me. I stopped playing this character at the end of the prologue at level 17. I got my ship and flew to Belsavis before getting a few screen shots. I didn’t want to get too far ahead because all the progress would be lost at the end of the beta. The other class I wanted to try out was the Imperial Agent as I had heard that the storyline of the class was a lot of beta testers’ favourite. The class storyline certainly didn’t disappoint. What’s more the mechanic of the class was a lot of fun as well. Imperial Agents, and their mirror class Smugglers on the Republic side use a cover mechanic. Every world has cover hot-spots that these characters can roll in to, giving them protection from enemies and also activating their range of cover abilities. They can also take cover in the open but initially it offers them no protection (just access to their cover abilities). I understand that later they get a portable cover ability which allows them to deploy an energy shield when they take cover in the open. The Imperial Agent had a lot of very fast, high damage abilities and within the first few levels I had two ranged AoEs that meant I could take down groups of three mobs with only a few abilities. My concern came from the fact that the first quickbar changes when you’re in cover so that your cover abilities are up. There is no way that I could see to change the other quickbars and several abilities are usable in and out of cover meaning that at some times I had the same ability occurring multiple times on my quickbars. It got a bit confusing at a couple of points. 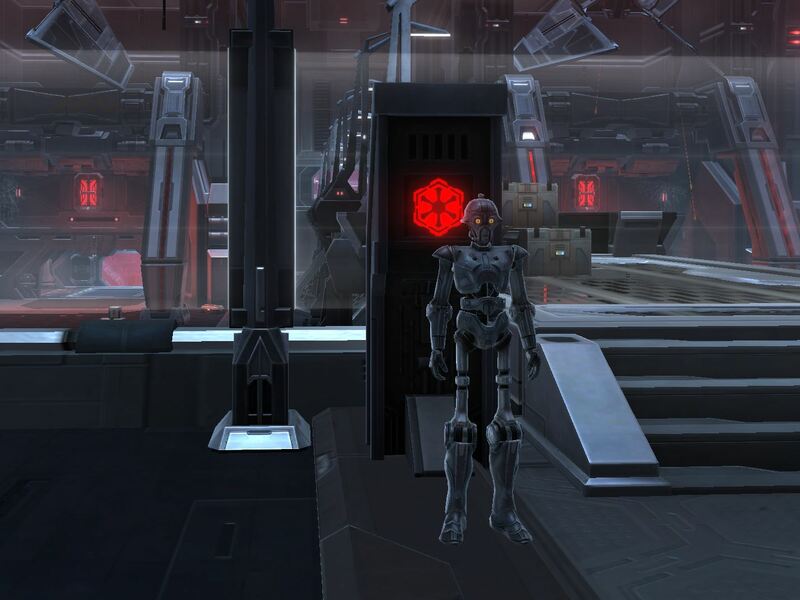 Hutta, where the Imperial Agent and Bounty Hunter start felt a little more open than Korriban. It was a lot easier to run from place to place without grabbing a stack of mobs. One thing I felt is that Hutta didn’t have the same sense of scale that other planets I saw had. It felt like you were in a small area, not part of a larger world – there were no distant fixtures or buildings, etc – to get you then sense of scale that Dromund Kaas and even Korriban had. The best part of the Imperial Agent was definitely the storyline – it felt important. A friend of mine who plans to play an Agent at launch after playing it in the beta (originally he planned to play a Bounty Hunter) commented that one storyline quest requires you to betray a character you have befriended previously. You are given the option of following your orders and executing him or trying to help him escape. My friend said that he actually agonised over the decision because he was really having trouble deciding. How many decisions like that do you encounter in WoW? I played the Imperial Agent to level 10 and then left Hutta for the Imperial Fleet. I took the Sniper Advanced Class at that point and tried to get a run for Black Talon. Unfortunately, at the time of day I was playing, people were only looking for Hammer Station runs (the level 17-18 flashpoint that follows Black Talon). I felt that I had to give the Republic a look in so I decided to create a trooper. The female trooper is voiced by Jennifer Hale who plays the main character in Mass Effect 1 & 2 when that character is female. I decided to give that a run, and I have to say – it did make the story feel very Mass Effect like. The mechanic of the Trooper (and the Bounty Hunter) is a mixture of melee and ranged combat. Opposite to the Inquisitor they start off with ranged attacks and then get a few melee attacks. I found that at the point I played up until they had no real AoEs which felt quite painful after playing the Imperial Agent. The Trooper was the class that I found the most bugs with. The first one I came across was that one of my conversation NPCs spawned only about a foot high. I didn’t spot the NPC at first and then I realised that my character was looking down at the ground where I spotted a miniature version of the character I was talking to. Interestingly, the mechanic in the game which makes characters look at each other’s’ faces (due to the fact that characters can be of different heights) allowed the character to look at the ground when speaking to a miniature NPC. The second “bug” I came across was more major and much more frustrating. At one point I felt it was going to stop me from progressing the character any further along their class storyline. I came across some groups of Imperial mobs where each group included one “Imperial Officer” (which was a strong) and a couple of normal mobs. The Imperial Officer mobs were much harder than a strong should be. I managed to avoid most of the groups, but there was one group guarding the quest object I needed to progress the class quest. It took me eight deaths to finally beat the group (the first two were just taking out the assistant mobs) and the go I finally got it I had had to use a Stim (like a stat increaser) and a medpack during the fight and I only survived with less than 5% health. I hadn’t even fought elites tougher than that. I may as well mention the death mechanic here. Items in TOR have durability like WoW, so that is the death penalty. When your character dies, you are given the choice of either resurrecting at the closest medical station (which are all over the place), or being revived on the spot by a medical probe. If you select the latter, you are given ten seconds of undetectable stealth to get away from whatever killed you. If you die multiple times in short order, you have to wait for a medical probe, with the wait time eventually getting to the point that you may as well go back to the medical centre. Like the Imperial Agent, I played the Trooper through until level 10 and went to the Republic Fleet to get my Vanguard AC. The Republic Fleet was simply a mirror of the Imperial one with a different skin – a little disappointing given the variety in the rest of the game. I didn’t have time to do The Esseles (the first Republic Flashpoint) so I just went to Coruscant to have a look at it. On Dromund Kaas, you land outside the city and you have to do some quests before you get to Kaas City. On Coruscant you arrive and go straight in to the city. At this point I was pretty much getting to the end of my beta weekend. During the beta I also made a Bounty Hunter and a Jedi Knight, but I didn’t play either of these classes past level 4. The Bounty Hunter was simply a mirror of the Trooper and I preferred to do Ord Mantell with the Trooper rather than Hutta again. The Jedi Knight I only played on the final afternoon as I got home from work with enough time to play for an hour before the beta ended. The minimal experience with the Jedi Knight made it seem very similar to a WoW Warrior. I ran in to a couple of bugs with this character including the small NPC issue and also a piece of equipment with no model (so my character appeared to be wearing no pants while wearing them). During the course of the weekend, I only got to have one flashpoint run, which was Black Talon with two friends. We had a lot of fun with this – though it wasn’t a massive challenge. We died on the first boss right as we killed it (DoT took us out) but after that we didn’t have any problems. The run all told took us about 40 minutes including watching all cut scene conversations. The best bit of the Flashpoint in my opinion was definitely the group conversations. It actually made the characters feel like they had character. Both of my friends were playing fat Bounty Hunters, though they did seem different when they spoke. One character seemed to be most interested in doing a job and usually referred to getting paid for his time. The other character spoke with his gun a lot, opting for mostly violent responses, whereas my Inquisitor seemed to mock or look down on the Sith military NPCs with condescension (I think most times an NPC claimed they couldn’t accomplish something without our help I had the option of responding “Pathetic”). Like you would expect with instanced dungeons, the loot drops were quite good and it quickly become obvious that there was an armour “set” for each class in the flashpoint. After completing it, we discovered a vendor outside the instance that sold the items available inside for credits. I’m not sure whether this was available before we ran the flashpoint. It certainly meant that you could complete an armour set you had only acquired a piece of in the flashpoint. Every character gets 5 companions (plus a ship-based droid companion) during the course of their class story. I only got the first companion for each of the classes that I played. The companions were nice, but they seemed a little lacking. The companion themselves are a welcome addition to game play – they fight for you, healing, tanking or dealing damage as required. That being said, they only say things very rarely, and especially with the melee companions, they can tend to get in the way when you are trying to interact with the environment. You also have to look after their inventory, so it’s one more aspect of the game that you have to manage. Also pathing isn’t currently fantastic with companions sometimes getting stuck. Like WoW pets, if they are stuck and you run far enough away, they simply appear next to you. The main problem I had with the companions over the course of the weekend was the fact that if you click on them (which you tend to do accidentally a lot as they take up a bit of room in your view), they say a little line which is supposed to indicate whether they want to talk to you or not (since they will only have storyline progressing conversations in a cantina or on your ship). They also occasionally say things after they kill enemies. The problem is that you can hear the comments of other players’ companions that are near you. Worse, if you are in an instanced area, you can still hear the comments of other players’ companions that are in a different incarnation of the instance. I got sick of hearing the constant snide comments of Mako (the Bounty Hunter companion) and Vette (the Sith Warrior companion). Crew skills are the crafting of TOR. They are broken up in to crafting skills, gathering skills and mission skills. All of the skills have sympathies with other skills. I only really looked at crew skills on my Inquisitor where I took Synthweaving (Crafting), Archaeology (Gathering) and Diplomacy (Mission). I had read that Diplomacy could award Synthweaving components, companion gifts and light side/dark side points. I took Diplomacy because it may give me crafting components and because I figured it would be a way to offset any light side points I may get. Rather than crafting things yourself, you send your companions to do it. When you give them a job (either gathering, crafting or running a mission) they become temporarily unavailable. At the level I was playing they tended to take 3 minutes to gather and 1 minute to craft. One you have crafted an item, you can either use it, sell it or reverse engineer it. Reverse Engineering returns the item to its component parts (though you never get as many as it took to make the item) but occasionally you might learn a rare version of the item by reverse engineering it. I reverse engineered a lot as I was levelling the skill and I managed to get about a dozen enhanced versions of patterns I knew. The only problem was that all of the enhanced patterns required Shadowsilk which I couldn’t get through any of my crew skills. I either needed to change from Diplomacy to Treasure Hunting or I needed to hit the AH. I never managed to make an enhanced pattern during my play through. Losing a companion was often inconvenient. At one point I went to complete a quest while my companion was off crafting and the game told me that the companion needed to be there to complete the quest (as they had a part in the completion conversation). Once you get your star ship however, your ship droid can be sent to craft and he can’t be brought on missions, so that lightens the load. The other fantastic part of crew skills is that you can assign a companion to sell your junk. The companion becomes unavailable for 1 minute and all of your grey items are instantly sold. It appears it can even be used inside flashpoints so it makes clearing your bags very easy. I really wanted to get my ship so that I could try Space Combat, so once my Inquisitor got her ship, I went straight in to a mission. Space Combat has been one of the most complained about aspects of the game in the beta. A lot of people want this aspect to be a full roaming flight simulator like X-Wing (and like in Star Wars: Galaxies). The game itself is actually a rail shooter. For my part, I really enjoyed the mission I did. It seemed to me like what I think it was intended to be – a mini-game. It was dynamic, I got good xp for it and it was fun, which is all I think it needs to be. At release I would probably use space combat as a diversion. In SWG it seemed required for several quests and it became a hassle – in TOR I think it will be a good way to blow off steam when you’re stuck on a normal quest. My only complaint was that there were no control instructions, so I had to figure out for myself that the right mouse button fires missiles. Overall, this beta weekend has secured my decision to buy and play this game. Over the four days of the beta I played around 35 hours. My total progress over this time was – Inquisitor 17, Agent 10, Trooper 10, Jedi Knight 4, Bounty Hunter 3. I had a massive amount of fun and I found the game to be very stable. I have beta tested a number of MMOs and TOR has definitely been the most stable MMO beta I have ever been involved with. In my opinion, I would be happy to pay for the game as it is now, but as I understand it, the retail version is a couple of builds on from what we saw over the weekend. It had a few niggling bugs here and there, and a couple of mechanics I wasn’t happy with, but I really feel that this is a game I will enjoy, and I’d encourage you all to try it for yourselves too. To me it’s a fully featured Bioware RPG that I can also play with my friends, and that’s exactly what I’m looking for. The fact that it’s the Star Wars IP is just cream on top. I will raise one final concern. One of the features I had heard of in the beta that I quite liked was the ability to match the colours of your armour to your chest piece, thus eliminating the need to look like a clown in mismatched armour. This feature was not in the build we played and some players have speculated that Bioware temporarily disabled it to make it easier to identify items with mixing default textures. Other people who claim to be close to Bioware claim that they removed it as it took away from the prestige of end-game raiders having matching armour sets. I certainly hope that this is not the case, as I would really like to see this feature in the game. More than once during the beta I didn’t buy or choose an upgrade to an item I had because it looked totally different from the rest of my ensemble. Other than this bugbear, this is the game for me. I hope you’ve enjoyed my review of the beta weekend, and that I’ll see you in a galaxy far, far away from December 15th. Thanks for such a long and detailed review. Some sites think what they put up “proper” reviews but I find them lacking. I love the Sith Inquisitor and the Sith Warrior. If you could possibly do a Sith Warrior review I would appreciate that. After completing it, we discovered a vendor outside the instance that sold the items available inside for credits. very good very in-depth, thanks for taking the time to fuel my anticipation! I think Steve is right.If you have a maximum of 4 people in a group the companions are automatically dismissed and you can only summon them when you’re out of the group. Right you are, that was a mistype in an older version of the review that I forgot to correct. HEROIC 4+ quests appear to be targetted at four players (as opposed to 2 players and companions) and the game does enforce a hard limit of four entities (player or otherwise) in a group. Thanks for the review. Fantastic to hear the ups and downs of your trials, and even some hints about mechanical aspects of the game. This is probably the most complete review I’ve read so far, and I really can’t wait to play this game (I opted out of the beta so it wouldn’t tarnish my view of the launch).